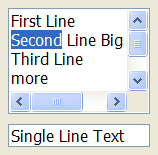 Creates an editable text field. action: name of the action generated when the user types something. It can be NULL. ALIGNMENT [Windows and GTK Only] (non inheritable): horizontal text alignment. Possible values: "ALEFT", "ARIGHT", "ACENTER". Default: "ALEFT". 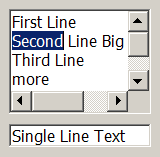 In Motif, text is always left aligned. APPEND (write-only): Inserts a text at the end of the current text. In the Multiline, if APPENDNEWLINE=YES, a "\n" character will be automatically inserted before the appended text if the current text is not empty(APPENDNEWLINE default is YES). Ignored if set before map. BGCOLOR: Background color of the text. Default: the global attribute TXTBGCOLOR. BORDER (creation only): Shows a border around the text. Default: "YES". CARET (non inheritable): Character position of the insertion point. Its format depends in MULTILINE=YES. The first position, lin or col, is "1". For multiple lines: a string with the "lin,col" format, where lin and col are integer numbers corresponding to the caret's position. For single line: a string in the "col" format, where col is an integer number corresponding to the caret's position. When lin is greater than the number of lines, the caret is placed at the last line. When col is greater than the number of characters in the given line, the caret is placed after the last character of the line. If the caret is not visible the text is scrolled to make it visible. In Windows, if the element does not have the focus the returned value is the position of the first character of the current selection. The caret is only displayed if the element has the keyboard focus, but its position can be changed even if not visible. When changed it will also change the selection but the text will be scrolled only when it receives the focus. See the Notes below if using UTF-8 strings in GTK. FGCOLOR: Text color. Default: the global attribute TXTFGCOLOR. INSERT (write-only): Inserts a text in the caret's position, also replaces the current selection if any. Ignored if set before map. MASK (non inheritable): Defines a mask that will filter interactive text input. 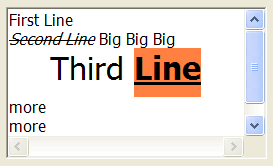 MULTILINE (creation only) (non inheritable): allows the edition of multiple lines. In single line mode some characters are invalid, like "\t", "\r" and "\n". Default: NO. When set to Yes will also reset the SCROLLBAR attribute to Yes. NC: Maximum number of characters allowed for keyboard input, larger text can still be set using attributes. The maximum value is the limit of the VALUE attribute. The "0" value is the same as maximum. Default: maximum. PASSWORD (creation only) [Windows and GTK Only] (non inheritable): Hide the typed character using an "*". Default: "NO". READONLY: Allows the user only to read the contents, without changing it. Restricts keyboard input only, text value can still be changed using attributes. Navigation keys are still available. Possible values: "YES", "NO". Default: NO. SCROLLBAR (creation only): Valid only when MULTILINE=YES. Associates an automatic horizontal and/or vertical scrollbar to the multiline. Can be: "VERTICAL", "HORIZONTAL", "YES" (both) or "NO" (none). Default: "YES". For all systems, when SCROLLBAR!=NO the natural size will always include its size even if the native system hides the scrollbar. If AUTOHIDE=YES scrollbars are visible only if they are necessary, by default AUTOHIDE=NO. In Windows when FORMATTING=NO, AUTOHIDE is not supported. In Motif AUTOHIDE is not supported. SELECTEDTEXT (non inheritable): Selection text. Returns NULL if there is no selection. When changed replaces the current selection. Similar to INSERT, but does nothing if there is no selection. SELECTION (non inheritable): Selection interval in characters. Returns NULL if there is no selection. Its format depends in MULTILINE=YES. The first position, lin or col, is "1". For multiple lines: a string in the "lin1,col1:lin2,col2" format, where lin1, col1, lin2 and col2 are integer numbers corresponding to the selection's interval. col2 correspond to the character after the last selected character. For single line: a string in the "col1:col2" format, where col1 and col2 are integer numbers corresponding to the selection's interval. col2 correspond to the character after the last selected character. In Windows, when changing the selection the caret position is also changed. The values ALL and NONE are also accepted independently of MULTILINE (since 3.0). SIZE (non inheritable): Since the contents can be changed by the user, the Natural Size is not affected by the text contents (since 3.0). Use VISIBLECOLUMNS and VISIBLELINES to control the Natural Size. SPINVALUE (non inheritable): the current value of the spin. The value is limited to the minimum and maximum values. SPINMAX (non inheritable): the maximum value. Default: 100. SPINMIN (non inheritable): the minimum value. Default: 0. SPININC (non inheritable): the increment value. Default: 1. SPINALIGN (creation only): the position of the spin. Can be LEFT or RIGHT. Default: RIGHT. In GTK is always RIGHT. SPINWRAP (creation only): if the position reach a limit it continues from the opposite limit. Default: NO. SPINAUTO (creation only): enables the automatic update of the text contents. Default: YES. Use SPINAUTO=NO and the VALUE attribute during SPIN_CB to control the text contents when the spin is incremented. In Windows, the increment is multiplied by 5 after 2 seconds and multiplied by 20 after 5 seconds of a spin button pressed. In GTK, the increment change is progressively accelerated when a spin button is pressed. TABSIZE [Windows and GTK Only]: Valid only when MULTILINE=YES. Controls the number of characters for a tab stop. Default: 8. VALUE (non inheritable): Text entered by the user. The '\n' character indicates a new line, valid only when MULTILINE=YES. After the element is mapped and if there is no text will return the empty string "". WORDWRAP (creation only): Valid only when MULTILINE=YES. If enabled will force a word wrap of lines that are greater than the with of the control, and the horizontal scrollbar will be removed. Default: NO. ACTIVE, FONT, EXPAND, SCREENPOSITION, POSITION, MINSIZE, MAXSIZE, WID, TIP, RASTERSIZE, ZORDER, VISIBLE, THEME: also accepted. Drag & Drop attributes are supported. See Notes bellow. ACTION: Action generated when the text is edited, but before its value is actually changed. Can be generated when using the keyboard, undo system or from the clipboard. c: valid alpha numeric character or 0.
new_value: Represents the new text value. Returns: IUP_CLOSE will be processed, but the change will be ignored. If IUP_IGNORE, the system will ignore the new value. If c is valid and returns a valid alpha numeric character, this new character will be used instead. The VALUE attribute can be changed only if IUP_IGNORE is returned. CARET_CB: Action generated when the caret/cursor position is changed. lin, col: line and column number (start at 1). pos: 0 based character position. For single line controls lin is always 1, and pos is always "col-1". pos: the value of the spin (after it was incremented). Returns: IUP_IGNORE is processed in Windows and Motif. MAP_CB, UNMAP_CB, DESTROY_CB, GETFOCUS_CB, KILLFOCUS_CB, ENTERWINDOW_CB, LEAVEWINDOW_CB, K_ANY, HELP_CB: All common callbacks are supported. Drag & Drop callbacks are supported. See Notes bellow. When MULTILINE=YES the Enter key will add a new line, and the Tab key will insert a Tab. So the "DEFAULTENTER" button will not be processed when the element has the keyboard focus, also to change focus to the next element press <Ctrl>+<Tab>. In Windows, if you press a Ctrl+key combination that is not supported by the control, then a beep is sound. When using UTF-8 strings in GTK be aware that all attributes are indexed by characters, NOT by byte index, because some characters in UTF-8 can use more than one byte. This also applies to Windows if FORMATTING=YES depending on the Windows codepage (for example East Asian codepage where some characters take two bytes). Internal Drag&Drop support is enabled by default. But in Windows the internal Drag&Drop is enabled only if FORMATTING=YES. In GTK the internal Drag&Drop can NOT be disabled, so it will conflict with the Drag & Drop attributes and callbacks. In GTK uses GtkTextView/GtkEntry/GtkSpinButton, in Windows uses RICHEDIT_CLASS (formatting)/WC_EDIT, and in Motif uses xmText/xmTextField, for Single/Multiline. Here is a list of the common keys for all drivers. Other keys are available depending on the driver. "BGCOLOR" = "255 128 64"